You won’t believe, but several hours ago, while surfing and looking for something unrelated to Geocities, we found a Geocities page that still exists! on Geocities! Not a folder with templates by Yahoo. Not an invisible GIF. But a real profile of a real user! 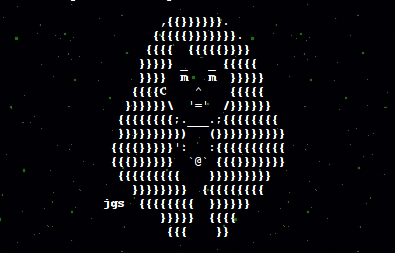 Namely famous ASCII artist Joan G. Stark. Last updated in 2001 as well. Both profiles are almost identical. And there is the 3rd one — http://www.ascii-art.com/. What’s going on? How did it happen? Was it forgotten? Protected? Paid? Are there other survivors? Update: the question about other survivors is answered in comments by Nick and Google http://www.google.ca/search?q=site%3Ageocities.com. What are all these profiles doing there? 3 Responses to Holy Joan! Could it be possible that the user, for whatever reason, had uploaded a custom .htaccess file with a more specific rewrite rule that overrides a top-level (but less specific) mod_rewrite? Very probably Geocities needed some .htaccess configuration files to make the service work. If they would allow such files to be used by users, they would have been crazeey! But indeed, maybe accidentally uploaded config files started to work after the deletion. It would mean that no actual deletion happened but somebody wrote a sloppy rewrite rule — and that Yahoo still has the data. Probably it wouldn’t make much sense for Yahoo to physically delete the files. Why spin up all the harddisks and risk the collateral loss of other data saved thereon?